It goes without saying that preservation of life is the reason to invest in road and car safety technology, but the financial implications which fatal and non-fatal accidents have on the economy are another factor which cannot be ignored. According to Reported Road Casualties Great Britain Annual Report 2014 the total cost of prevention of reported road accidents in 2014 was estimated to be £16.3 billion – this includes an estimate of the cost of damage only accidents but does not allow for unreported injury accidents. 1,732 road deaths were reported in 2015. In a 2015 McKinsey Report, researchers estimated autonomous vehicles (AV) and advanced driver assistance systems (ADAS) could reduce accidents by up to 90%; more than 90% of accidents each year are caused by human error, but with AVs this factor is obviously completely removed. 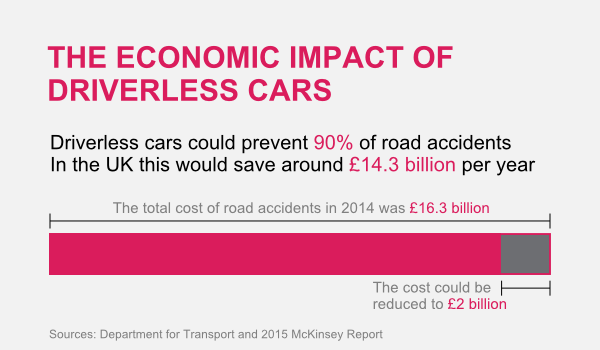 Taking 2014’s statistics as an example – the widespread adoption of autonomous vehicles could save the UK approximately £14.3 billion per year. 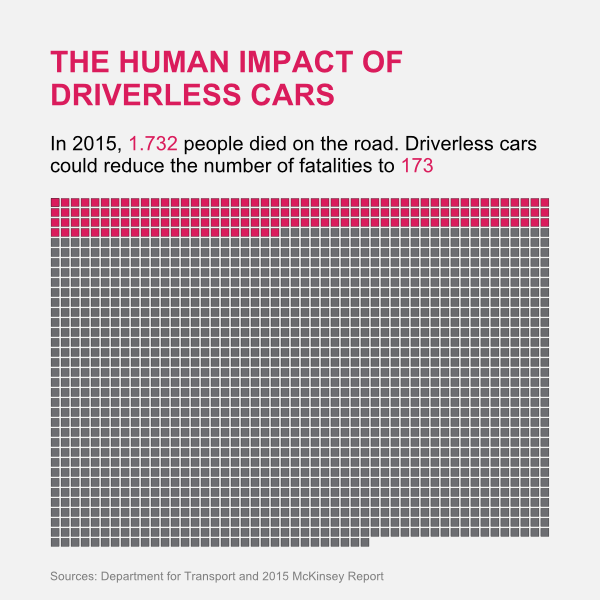 This means that – again using 2015’s figures as a benchmark – self-driving cars could save as many as 1,558 lives per year, which over a period of a decade would equate to saving well over 15,500 people. Until now, car safety technology development has been about assisting the driver’s manual actions and mitigating the adverse ones. However, we are now in an era where autonomous vehicles completely remove the element of human error. In order to showcase these advancements in car safety and the shift from manual, to automated, to autonomous, Quoteme.ie have created a resource which documents both current and future technologies and their respective influence on making our roads safer. Current and Future Car Safety Technology also highlights which pioneering manufacturers are already incorporating these cutting-edge innovations into some of the more advanced vehicle models.